The Auto Giants presented their best vehicles at 2012 Los Angeles International Auto Show and once again gave another reason to automobile manufacturers to shine with their most wanted vehicles. Toyota walked on this auto show RAM with all new RAV4 and won the hearts of millions who were eager to see this Crossover SUV. 2013 Toyota RAV 4 is powered by 2.5L 4 Cylinder engine that produces torque of 172 lb-ft, you might be disappointed to read that V6 engine that was available as an option in previous models will not available now. EPA ratings of this All New RAV 4 are matchless as compare to other vehicles in its class. Front Wheel Drive Models presents EPA range of 24mpg in the city and 31mpg on the highway. All Wheel Drive Models will deliver EPA value of 22mpg in the city and 29mpg on the highway. Fuel economy is further improved by Eco Mode that will help you to achieve maximum fuel economy. Now you can enjoy a sporty experience with Dynamic Torque Control (AWD) that is available in sport mode, this mode work so well with electric power steering and you will forget the ride of conventional sports cars. Auto: In Auto Mode power is provided with front wheels. Lock: In Lock Mode power is delivered to four wheels. Sport: Vehicle Stability Control System work at its best in Sport Mode. Exterior of All New RAV4 is simply amazing, tough and strong looks make it more appealing for off-road lovers who always remain important to drive a muscular and athletic vehicle. Toyota has used high quality and high strength steel in its body to present a safe vehicle. 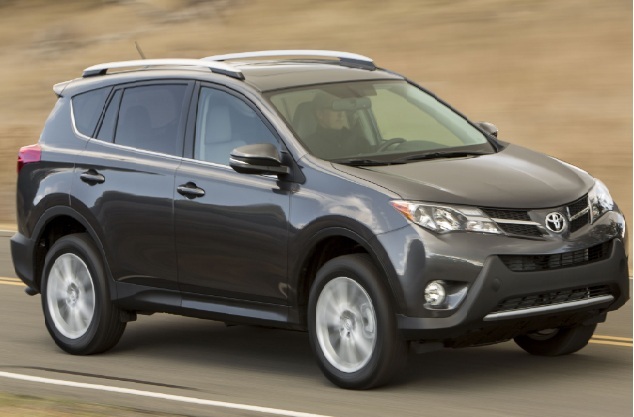 Like every typical off-road model of Toyota, the 2013 RAV4 boasts a spacious and roomy interior. Infact you will find it more comfortable and spacious as compare to previous models. All grades of All New RAV4 have been designed keeping the view the ultimate comfort and safety of passengers. You will find it more cozy and comfortable than your Lounge couch, you will truly feel at home after its first ride and it can be your second home if you want to use it for adventure trips. Tilt/Telescopic steering column is available as a standard feature on all models on All New RAV4. Urethane Steering Wheel is available on LE and XLE. Leather Wrapped Steering Wheel is available with Limited Grade. Multi Information Display is available as an entertainment feature. You can easily adjust seats of 2013 RAV4 LE in 6 adjustable positions. Second row of all the 2013 RAV4 Grades can be folded at the position of 60/40. The 2013 RAV4 is available with all the features of Star Safety System which is the biggest USP of Toyota. Moreover 8 airbags are available in all grades of All New RAV4. All New Toyota RAV4 will be available at the start of 2013.